With their 8 Bit IPA having won over plenty of admirers, Stockade has pursued a darker, or perhaps – if the pair of fornicating robots on the label is any guide – racier streak with its latest IPA. 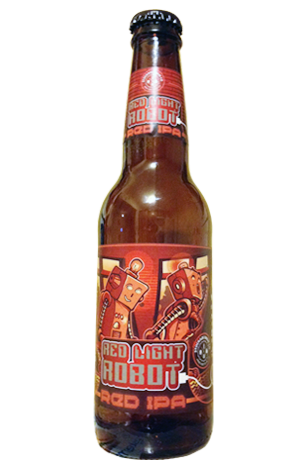 Red Light Robot is a red IPA, and a wee ripper of a RIPA at that. Built on four American hop varieties – Citra and Centennial in the whirlpool plus Columbus and Simcoe in the brewery’s enormous dry hopper – it’s got spicy elements and plenty of resinous character. While the hopping regime is ample, it’s not a destructive beer in terms of its bitterness or all around aggressiveness, thanks in main to the caramel sweetness from the malt which evens things out nicely. A dash of black malt means it’s turned out very dark – beyond red unless you’re looking in the right sort of light – which seems to fit nicely with its winter release. Red Light Robot might turn a few heads with its provocative label but it ought to turn more with what’s in the bottle.